Get ready to make a statement with the impressive Ancona Pro UC Turbo Series Hidden Controls 48 Inch range hood. Built from a sophisticated design with highly resistant 430 stainless steel, the sleek hidden controls allow you to adjust settings to your optimal preference. With a powerful 1200 CFM ventilation system, the Pro Series UC Hidden Controls range hood is an ideal choice when it comes to eliminating odours, smoke and steam from any cooking area. The durable easy-to-clean slanted stainless steel baffle filters are simple to remove and will redirect grease and moisture to hidden grease traps. The Ancona Pro UC Turbo Series Hidden Controls 48-inch range hood is the essential asset that will deliver the utmost culinary experience to your kitchen. External ventilation only. Internal air recirculation not possible.Optional single-piece chimney sold separately. Glacier Series.The smart choice. Air quality is a top concern for today's families. The Broan series, with its superior capture efficiency, is the ideal solution. What's more, this model's features provide the best quality and performance for the price. This sleek, quiet and powerful under cabinet range hood by Cyclone is a true standout in any kitchen. Perfect for those with smaller spaces, the CYS1000R offers a centred two-speed fan to keep the air clear as you work, as well as two bright lights with two settings to help you see what's cooking! UC PRO Turbo 48 inch Under-Cabinet Range Hood in Stainless Steel Get ready to make a statement with the impressive Ancona Pro UC Turbo Series Hidden Controls 48 Inch range hood. Built from a sophisticated design with highly resistant 430 stainless steel, the sleek hidden controls allow you to adjust settings to your optimal preference. With a powerful 1200 CFM ventilation system, the Pro Series UC Hidden Controls range hood is an ideal choice when it comes to eliminating odours, smoke and steam from any cooking area. The durable easy-to-clean slanted stainless steel baffle filters are simple to remove and will redirect grease and moisture to hidden grease traps. The Ancona Pro UC Turbo Series Hidden Controls 48-inch range hood is the essential asset that will deliver the utmost culinary experience to your kitchen. 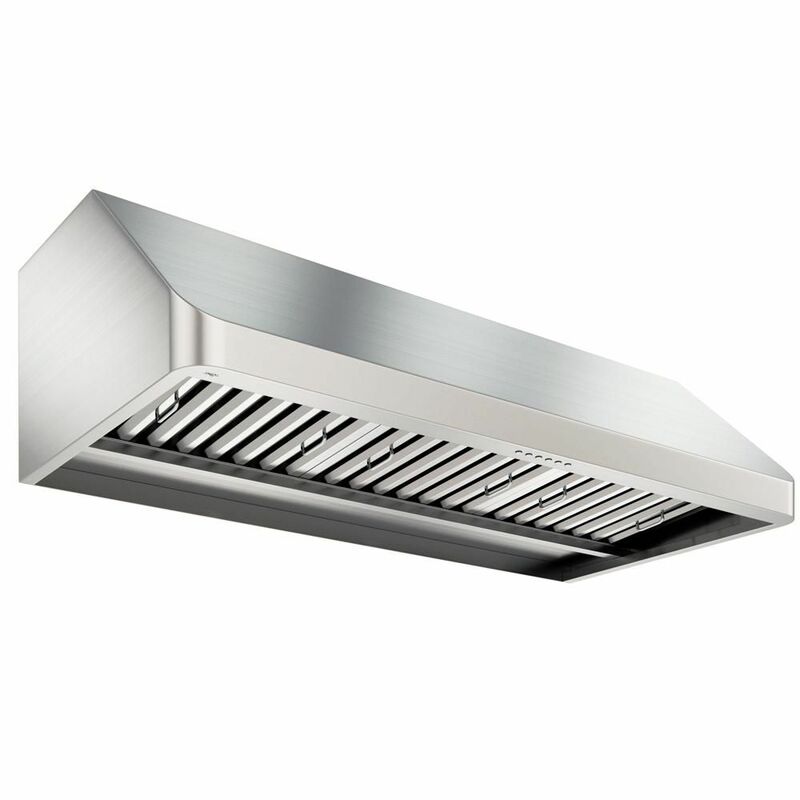 UC PRO Turbo 48 inch Under-Cabinet Range Hood in Stainless Steel is rated 3.8 out of 5 by 78. Rated 5 out of 5 by Gigman from Sleek impressive design I installed this one month ago and we love the look of it! The fan performance is excellent and the blue LED backlights around the controls are impressive, as are the LED area lights. Rated 1 out of 5 by Bonnie56 from It is extremely noisy! Bought this 3 months ago extremely noisy when you use the fan. Rated 5 out of 5 by Busygirl from fits in well Purchase a few months age and installed recently with the new cupboards in place. The lighting is great. It is bright enough without blinding you as you cook. The fan works well in taking the steam and cooking smells away from the kitchen. Rated 4 out of 5 by Tom S from Stylish and modern look We bought and installed ourselves and it worked very well. The only thing I would have liked would be a slightly quiter fan. All and all a good fit and looks fantastic. Rated 4 out of 5 by Joanne from Beautiful and great price Just installed hood fan. Very easy install. Requires ceiling outlet as it plugs in from top but can be hardwired. Looks amazing. Light is very good as are fan settings. Baffle system is great vs having filters but they are very sharp on the edges as are the 2 spacers. They are dishwasher safe but care will be needed if any hand cleaning of baffles is required. They have handles to remove them so this will help but spacers do not. But overall its a great fan as similar fans sell for double + the price.